Does the Jersey Devil really exsist? My research question was, Is the Jersey Devil real. In 1735, on a rainy night, the Jersey Devil was born. The Jersey Devil was born a normal child, but then it turned into the Jersey Devil (The Jersey Devil, 2016). 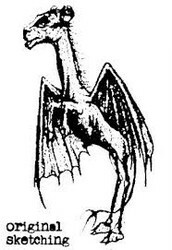 The Jersey Devil has bat wings, a horse head, cloven hoofs, and a tail (Clark, 2003). The mother of the Jersey devil had 12 other children berfore the Jersey Devil was born. (Clark, 2003). In 1909, a police officer heard dogs barking and then saw a large winged creatuer (Clark, 2003). Also in 1909, about 100 people have claimed to have seen the Jersey Devil (Clark, 2003). It is said that the father of the Jersey Devil was the devil himself (The Jersey Devil, 2016). It's also said that the Jersey Devil kills live stock (The Jersey Devil, 2016). In my opinion, the Jersey devil isn't real because it said that the police man saw a large winged creature, it could have been a large bird.